the life of a wife: Happy Donut Day! 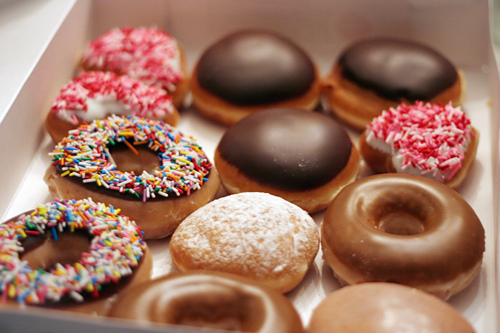 It's National Donut Day! Today Dunkin Donuts is giving away a donut with a purchase of any beverage. And even better, Krispy Kreme is giving away a free donut per person - no purchase necessary! A fresh glazed donut (yum!) is one of my guilty pleasures so I will definitely be stopping by for a donut on the way to work :) Happy Friday - and happy June! Whoa those look good! Too bad I am gluten free and going paleo (-: Enjoy one for me! good to know! we have a dunkin donuts about 1/4 mile from us which i have obviously loved! LOVE LOVE LOVE!!!! Wish we had a Krispy Kreme closer to home......will totally make up for it this weekend when we travel though!!! Darn! I missed that day! I will have to celebrate another time!